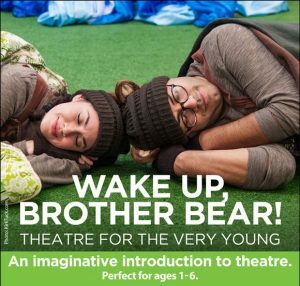 Shows on Tuesdays and Thursdays at 10 a.m. and 12 p.m.
Special rate for Brother Bear: $6 for youth and $14 for adults (1 teacher for every ten students is free). If you want to receive e-mails with news about our shows for schools, please click here to sign up for our mailing list. COST: $8.00 per child. Title 1 Discounts available based on a sliding scale. 1 adult for every ten children is free. Each additional adult is $16. After you make your reservation, you will receive a confirmation notice within three days. Payment in full is due one month before your visit. If find you need an extension on your payment due date, please call 512-476-0594 x236 and we will help set a new payment due date. For every ten student tickets purchased, you will receive 1 free adult ticket. Both teachers and parents should be included in the number of adult tickets reserved. Parents cannot purchase individual tickets with the theatre, as all reservations must be done through the school. Reservation numbers may be increased at anytime, if space allows. However, any decreases to your reservation must be made one month prior to visit. After this time all reserved seats must be paid for regardless of day-of attendance. Cancellations must be given in writing at least 4 weeks prior to reservation. No refund for payment will be given if inadequate notice is given. ZACH Theatre is located right next to Zilker park and has a small park and baseball field on site. Please feel free to utilize these areas for a picnic lunch or recreation area. Remember to reserve your buses early.